These photos of Ethiopia highlight the tremendous wealth of attractions the country has to offer visitors. Travel to Ethiopia is becoming increasingly popular as people discover ancient religious and historical sights that rival those of Egypt (without the tour buses). The variety of languages and tribes, particularly in the Omo River Region, is enough to satisfy anyone's inner anthropologist. Adrenalin seekers can trek in the impressive Simien Mountains, or white-water raft down the Omo River. Birders can enjoy more than 800 species of birds and if you enjoy primates, the rare Gelada baboon is a true treat for the eyes. While travel in Ethiopia is still somewhat rough; buses are bouncy and there aren't too many five star hotels -- the rewards are worth it. Find out more about traveling to Ethiopia. Click on the images below for more information about each destination. Many thanks to Robert Eilets; Charles Roffey; Robert Eilets and Angela Fairbank for the use of their images. Ethiopia is filled with important Christian and Muslim sites. 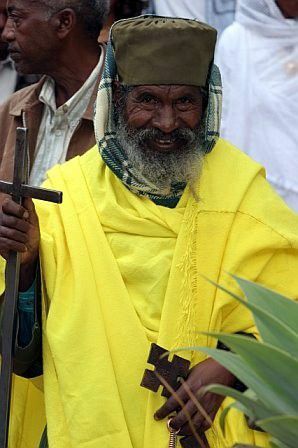 Pilgrims from all over the world come to Ethiopia to walk the Holy Routes. More information about traveling to Ethiopia. Bahar Dar is situated on the shores of Lake Tana, the source of the Blue Nile. Visitors come here to see the monasteries and water falls. Lalibela is one of Ethiopia's holiest towns for Orthodox Christians. Established in the 12th Century, Lalibela was built to be the New Jerusalem. Lalibela, in Ethiopia's central highlands, is now the size of a large village, but in the 12th century it was a major holy city. Today, visitors to Lalibela come to marvel at the unique churches built out of solid rock. There are 13 of them and all are thought to have been built during the 12th and 13th centuries. Lalibela remains an important site for pilgrims and the town is literally filled with priests wearing impressive, colorful robes. Lalibela is a unique place to visit, whether you're on a religious tour or simply sightseeing. Karo women scarify their chests to beautify themselves. Scars are cut with a knife and ash is rubbed in to produce a raised welt. The Karo excel in face and body painting, practiced in preparation of their dances and ceremonies. They pulverize locally found white chalk, yellow mineral rock, red iron ore and black charcoal to decorate their bodies, often imitating the spotted plumage of a guinea fowl. Feather plumes are inserted in their clay hairbuns to complete the look. The clay hair bun can take up to three days to construct and is usually re-made every three to six months. Their painted facemasks are spectacular. According to the Murulle Foundation, the Karo tribes' existence is somewhat precarious today. The inevitability of the encroaching populace and the introduction of modern weaponry has affected their already delicate ecosystem. Being the smallest tribe in the area, this group obviously struggles with direct threats from nearby tribes that have more gun power, greater numbers, and likely coalitions with one another. Many tour companies that specialize in Ethiopia offer tours to the Omo River Region. You can often add on a tour of some of Ethiopias famous religious and historical sights. Below is a sampling of itineraries which focus on the cultures of the Omo River Region. Omo River Expeditions from Safari Experts. This is 14-day trip down the Omo River in Southern Ethiopia to Lake Turkana in Northern Kenya. Intrepid Traveler offers a 10 day cultural tour of the Omo River Region in Ethiopia. Photo Safaris offers a 17 day cultural tour where photographing the various tribes in the Omo River region is the focus of the tour. Remote River Expeditions offer a 13 day and a 24 day tour of the Omo River region. This is a white water rafting trip combined with stays in local villages and bird watching. Green Land Tours offers several different itineraries to the Omo River region and will accommodate special requests to view important ceremonies. Lalibela in is one of Ethiopia's holiest towns for Orthodox Christians. Established in the 12th Century, Lalibela was built to be the New Jerusalem. Hamer women adorn their necks with heavy polished iron jewelry. The Hamer are pastoralists and number about 30,000. They are known for their practice of body adornment and wearing a multitude of colorful beads. Women adorn their necks with heavy polished iron jewelry. Hamer society consists of a complex system of age groups. To pass from one age group to another involves complicated rituals. The most significant ceremony for young men is the "jumping of the bull" - the final test before passing into adulthood. Several days before the ceremony, initiates pass out invitations in the form of dried knotted grass. The ceremony lasts three days. Late in the afternoon on the final day, ten to thirty bulls are lined up side by side. The naked initiate rushes towards the animal, vaults onto the first bull's back and then runs across the line of animals. At the end of the line he turns back to repeat the performance in the opposite direction. He must make this unstable journey without falling. The Hamer men have a reputation of being less than adoring husbands. According to photograper JP Dutilleux "the women submit to the ritual floggings proudly and love to show the deep scars that are regarded as a proof of devotion to their husbands. Images from a Hamer Village by Monique Jansen. Harar is a holy center for Muslims and is situated in Eastern Ethiopia. This walled city is a fascinating place, filled with Islamic and Christian history. The Simien Mountains in northern Ethiopia are one of Africa's highest mountain ranges with peaks often covered in snow. The mountains are popular with trekkers. More information about the Simien Mountains. The Mursi live between their dry season range in the Mursi Hills, and their wet season range on the Tama Plains, north of Mago Park in the Omo River region of South-Western Ethiopia. They care for livestock and plant some crops. They have a war-like reputation given their strong desire to control as much grazing land as they can for their livestock. And although the Mursi have been relatively isolated from the world outside the Omo River region, it is not unusual to see the men carrying AK-47 rifles. The men practice light scarification on their shoulders after killing an enemy, and shave geometric patterns on their head. During dances and ceremonies they adorn literally every part of their body with white chalk paint. Young unmarried men practice group stick fights. The winner is carried on top of poles to girls waiting beside the arena, who decide among themselves which of them will ask his hand in marriage. When a young Mursi girl reaches the age of 15 or 16, her lower lip is pierced so she can wear a lip plate. The larger the lip plate she can tolerate, the more cattle her bride price will bring for her father. Survival International Report on the Mursi's struggle to retain their land rights. Intrepid Travel offers a 10 day cultural tour of the Omo River Region in Ethiopia. Markets in Ethiopia are lively and interesting places to visit. The market in Addis Abbaba is one of the country's main attractions. The Karo excel in face and body painting, practiced in preparation of their dances and ceremonies. Debre Zeyit is a town, close to the capital Addis Ababa, which boasts five crater lakes and is a popular place to unwind for city folk. Aksum is Ethiopia's holiest city and an important destination for Orthodox Christian pilgrims who believe the Ark of the Covenant resides here. Aksum is dense with important religious and historical buildings. The Lonely Planet Guidebook likens it to Egypt's Luxor, without the tour buses. The famous Steles (one seen in this image) is one of the main attractions. There are also churches, palaces, tombs and more to explore. Ethiopia is a birders paradise with over 850 species. Gelada baboons are very rare and one of the main attractions of the Simien Mountains. The Simien Mountains in northern Ethiopia are one of Africa's highest mountain ranges with peaks often covered in snow. The mountains are popular with trekkers and are considered by many as the most beautiful mountains on the continent. Debre Zeyit is a resort town just south of Ethiopia's capital, Addis Ababa. When a young Mursi girl reaches the age of 15 or 16, her lower lip is pierced so she can wear a lip plate. The Omo River Region in Ethiopia is where you can combine a great white-water rafting trip with a visit to some of the most interesting tribes in Africa. According to the Murulle Foundation, the Karo tribe's existence is somewhat precarious today. The inevitability of the encroaching populace and the introduction of modern weaponry has affected their already delicate ecosystem. Being the smallest tribe in the area, this group obviously struggles with direct threats from nearby tribes that have more gun power, greater numbers, and likely coalitions with one another. The Hamer men have a reputation of being less than adoring husbands. According to photgrapher JP Dutilleux "the women submit to the ritual floggings proudly and love to show the deep scars that are regarded as a proof of devotion to their husbands. Ethiopia is filled with incredible religious historical sights that are still drawing hundreds of pilgrims every day.